The Update International TBC-6BK tea bag chest has six compartments to provide you with a convenient organization option for packaged teas. It has a matte black finish and a clear plastic top that allows for the contents to be seen while the lid is closed. "Working out well. I did have to clean the clear window, but outside that works very well." "This was the first time I had ordered from Katom. I will say should we need anything else that you carry, I will definitely order again. When I..."
"Great purchase and great service"
"This was the first time I had ordered from Katom. I will say should we need anything else that you carry, I will definitely order again. When I received the first one, I opened right away to see what it looked like. It looked like one had a scratch, but all I did was wipe it down. Outside that looks great. I even referred an employee that will be ordering for her personal use. The price was great as well." "looks "rich" and nice presentation. i am going to use this box to organize my crafting items." "The tea box is beautiful and arrived in perfect condition. The only issue was the shipping took forever." "I recently purchased this tea box, It was damaged in shipping and they sent me a replacement immediately. I am Very happy with the product and the customer service." "I recently ordered this Tea Box, it was received in broken condition. I contacted the company and they sent me a replacement box no questions asked and was told to keep the box for 7 days in the event UPS wanted to check the package and product. Obviously UPS was not very careful with my package, there was extra packing tape as if it had been opened or damaged. The new product came with extra packing material and arrived in perfect condition. I am VERY satisfied with this company and their product." "When I opened the package and pulled out the box the divider pieces were broken and laying inside. I opened up the box and two screws fell out of the hinges. I thought they were just loose and fell out but they just dropped right into the holes, like the holes were too big for the screws. I am sending it back for a refund. I actually tried to give a ZERO star rating but it would not let me." "It was a great price and came in great time. It was just for what I was looking for." "I've been looking for an affordable tea caddy. When I saw the one that KaTom offered, I couldn't believe the price. So glad I ordered it. Excellent in every way." "Poor quality. Lid scuffed and the inside dividers are bowed." "We have a lot of different tea bags in our household! Great way to be able to pick and choose and saves numerous boxes in the pantry!" "I was organizing my pantry and had a large basket corralling all my tea boxes. None of them were full. Using the Wooden Tea Chest allowed me to empty 10 tea boxes and get rid of the basket that was taking up so much space. It's nice too to put out at meals for everyone to select their own tea. I used to just pull all the boxes of tea out and they would take up an entire counter." 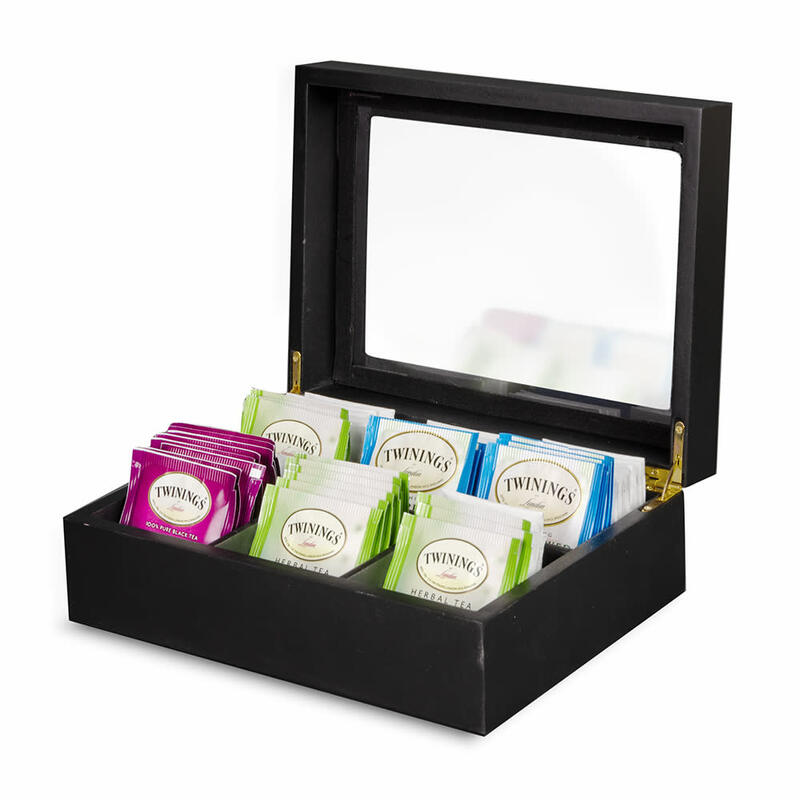 "Great to keep teas organized and at easy reach. Great product. I'm very happy with my Tea chest."